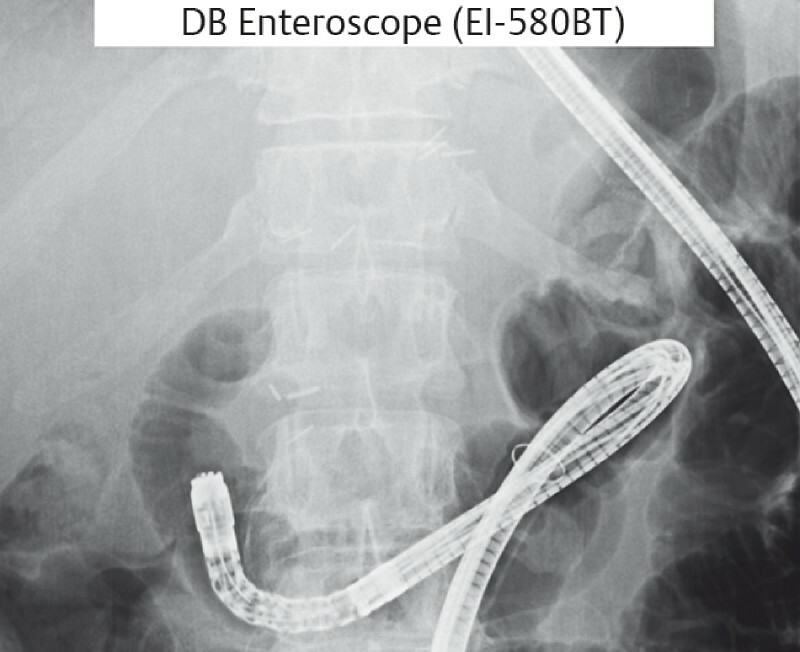 Overtube-assisted enteroscopy procedures, such as double-balloon enteroscopy (DBE), can facilitate endoscopic retrograde cholangiopancreatography (ERCP) in patients who have undergone gastrointestinal surgery, for example Billroth II gastrectomy   . Also peroral direct cholangioscopy has been described in patients with surgically altered gastrointestinal anatomy  . 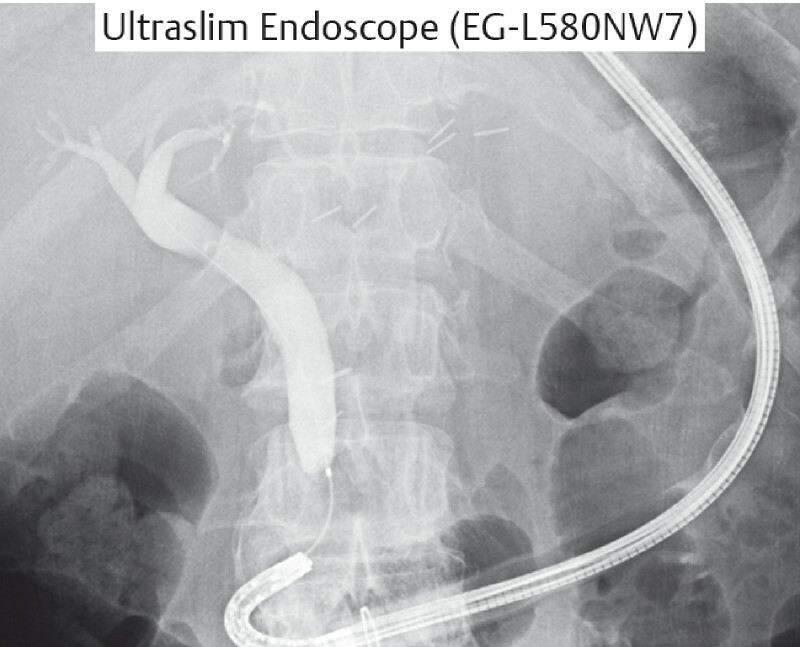 The success rates of overtube-assisted enteroscopy and ERCP were high in such patients; however, cannulation was usually difficult and sometimes impossible, especially in patients with a naïve papilla. A 61-year-old man who had undergone Billroth II gastrectomy for gastric cancer at 58 years of age, and had received adjuvant chemotherapy for 1 year, presented with a history of high fever, jaundice, and abdominal pain. Computed tomography and magnetic resonance imaging did not reveal any common bile duct (CBD) stone, but did show bile duct dilatation. The patient was diagnosed with cholangitis suspected to be related to CBD stone, and endoscopic retrograde cholangiography (ERC) using DBE (EI-580BT; Fujifilm) was attempted as treatment for the CBD stone ([Video 1]). However, bile duct cannulation was difficult because of misalignment between the cannula and bile duct axes ([Fig. 1]). Video 1 Bile duct cannulation technique using an ultraslim endoscope in conjunction with a short-length double-balloon enteroscope. Fig. 1 Bile duct cannulation was difficult using a double-balloon enteroscope, because of misalignment between the cannula and bile duct axes. 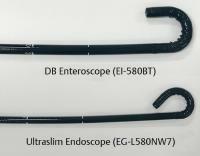 We therefore decided to use an ultraslim endoscope (EG-L580NW7; Fujifilm) because it has a greater up-angle and a smaller radius of curvature than a DBE enteroscope ([Fig. 2]). The endoscope was removed through the overtube, which was left in place. The shorter working length of the gastroscope necessitated modification of the overtube, as illustrated in [Fig. 3]. An aperture of > 10 mm was created near the patient’s mouth and the ultraslim endoscope was inserted through the aperture. The flexibility and wide range of movement of this endoscope facilitated alignment of the bile duct axis. 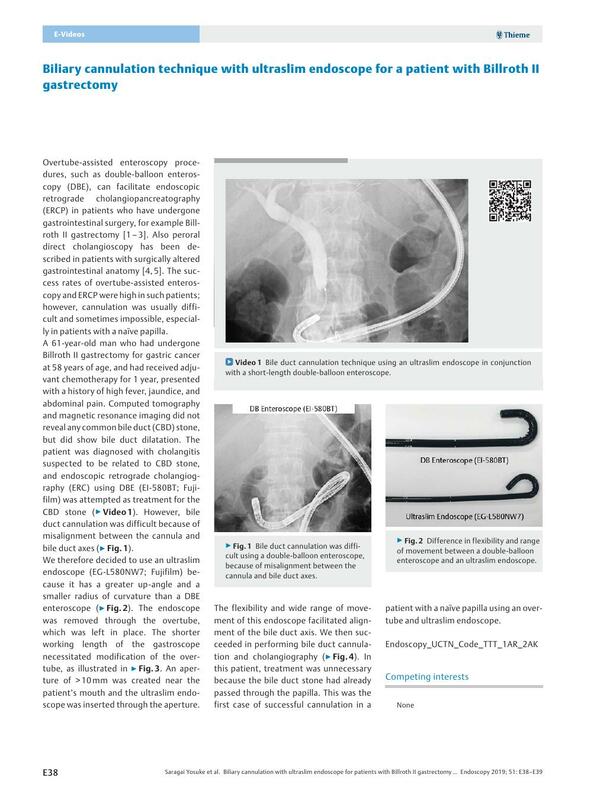 We then succeeded in performing bile duct cannulation and cholangiography ([Fig. 4]). In this patient, treatment was unnecessary because the bile duct stone had already passed through the papilla. This was the first case of successful cannulation in a patient with a naïve papilla using an overtube and ultraslim endoscope. Fig. 2 Difference in flexibility and range of movement between a double-balloon enteroscope and an ultraslim endoscope. Fig. 3 A modified overtube and ultraslim endoscope. In the case described the overtube remained in situ in the patient. a The working length of the ultraslim endoscope was too short for adequate operation through the overtube. b An aperture was created in the overtube. The ultraslim endoscope inserted through the aperture had sufficient operability. Fig. 4 Bile duct cannulation was successfully performed using an ultraslim endoscope.